Because I've been robbed of the start of this series I have to start at number twelve, but fortunately for me it's surprisingly easy to pick up what's going on, which is a real tribute to the writers. The story, that is as far as I can tell, follows a martial arts school and a select few warriors of higher stature that are on a quest to fight an evil organisation of super villains. The story begins with a fight almost half way through, a young hand to hand warrior faces a huge monk known as Anjei the destroyer. The destroyer has become enraged in anger over the death of the children he was supposed to guard, but now the young warrior's tactic is to not fight Anjei but to reason with him. Finding out why the destroyer is so full of anger the young fighter appeals to his monk instincts and the destroyer is turned back into the gentle man he once was. There is a total of five battles throughout the DVD and all of which are fantastically drawn and you can tell that the animation has had a lot of care and time put into it. Sound clarity and picture quality is great, with clear fine lines drawn on all the main characters there are only a few times where there are some guys in the back ground that are poorly drawn. With all the dialogue happening in and during the battles they take great care in the animation and of course the way the battles portray the characters emotions. All confrontations and pivotal points of the story happen in battle and you can tell the writers know this, giving the characters fantastic levels of detail really contributes to the impact of each individual. For some time now I've been looking for a decent animation movie or series that gave, not only great animation and action scenes but also a story line that's interesting and leaves you inspired by portraying the honor of battle. 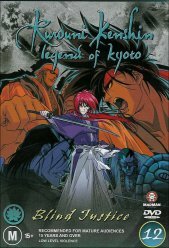 Until now there was only one movie, but after seeing episodes 48 to 52 of Rurouni Kenshin Legend of Kyoto, I'm very impressed and my faith in good manga films is restored. The outtakes aren't really very funny they are just normal stuff ups of the voice actors. Extras are a bit boring with liner notes, yay not; trailers and of course creditless closing the extra score will have to suffer for this. In all honesty the story line rocks and this series is one you shouldn't miss and I'm not just saying that, it's very hard to find a manga series with such grace, detail and such high quality animation.